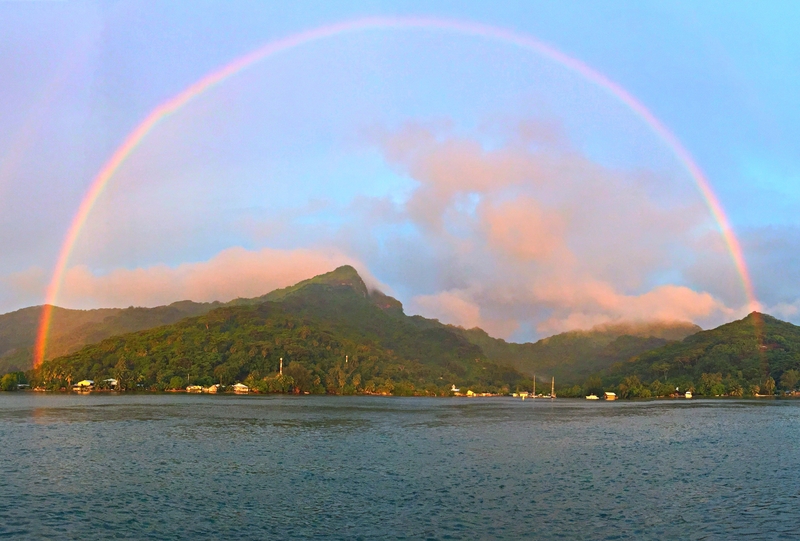 After spending nine days in Moorea we decided to head out to a little island called Huahine. The island is actually two small islands that are joined, at low tide, by a sandpit. In total they are just 10 miles long and 8 miles wide. We found Huahine to be a wonderful spot to get away from all the tourists and just enjoy the local life and people. The provisioning was good and the people were awesome! There’s a restaurant on the water near the main anchorage called the Huahine Yacht Club. We spent a bit of time there as it’s where most of the yachties tend to hang out. The food was good and the atmosphere was perfect. We brought our friends, Ed & Linda of SV One Fine Day there on our last evening together. That night we met a large, local family who was sitting beside us and spent a couple of hours getting to know them. One of the ladies was trying to teach me Tahitian while I tried to teach her English. They were such a wonderful group of people who welcomed us with open arms and hearts. Of course we’ve found most of the islanders to be this way. Dan had been looking for some island beads but all we had been able to find were the cheap, plastic ones you find in the tourist stores. On our last night at the HYC our server had on some amazing beads. Dan was determined to get them. He asked our server if he could buy them from him. He was a bit hesitant because his uncle had given them to him for a celebration of some sort but eventually they settled on a price. Dan was as happy as he could be and our server, well, let’s just say he made out pretty good on the deal. We only got to spend two nights here but would definitely have loved to stay longer. Our last night there was a bit sad as we were leaving Ed & Linda behind. They were leaving fr Raiatea to haul their boat out until next cruising season. We won’t see them until next year where we will hopefully meet up with them in Fiji. After our dinner on shore we stopped back at their boat for some after dinner, Bon Voyage cocktails. We’re sure going to miss these two! Previous post: Moorea … The Wild Side! Names are Mark and Dana Marsh just in case you run into them. Keep having a ball!!! It’s certainly been a whirlwind journey to be sure. Glad you are enjoying the posts!